This morning I felt like having some savory pancakes for breakfast. Luckily I had Nila Aunty’s recipe in my files. It is such a simple and delicious breakfast that I wanted to share it with you. Make a batter, consistency similar to pancake batter. Pan fry like a pancake. I like to pour a small amount of oil in the center of the skillet, and then pour the batter on top of it. This ensures that the oil spreads all underneath the pudla, and you only need a little oil. If you don’t have chickpea flour (besan), but you do have a powerful blender like a Vitamix or BlendTec, you can just grind up some dry garbanzo beans. If you don’t have tomato, you can also use some sun dried tomatoes. I sometimes sprinkle some sesame seeds on the batter just after pouring it onto the griddle. Serve with cilantro chutney or soy yogurt. 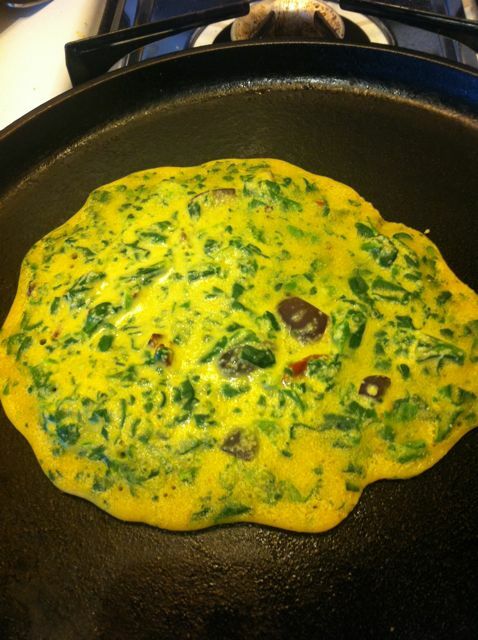 Make a thicker pancake and/or wrap up some other vegetables in it for a heartier meal.